Looking for deli fried chicken, bakery pies or other pre-made convenience food? Don’t be surprised if none of it turns up on the massive buffet on the Dial farm during the annual 4th of July picnic. I certainly didn’t see it at this year’s celebration. “Everyone brings their A game to this event,” said Jolene Schleisman of Lake City, Iowa, who has been attending the 4th of July picnic since she was a child. While my family has been attending the picnic each July for a few years, the event started in 1954 on Bud Burley’s farm near Lake City. Mike and Dorothy Nichols hosted the party the next year and maintained the tradition until 1981. 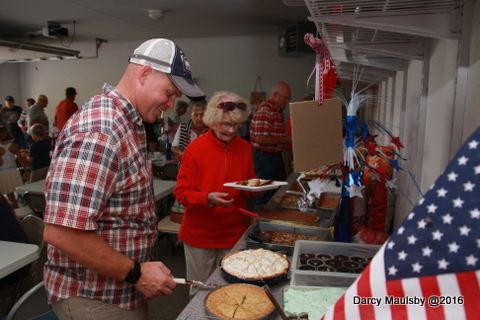 Then their neighbors, Gerald and Alice Ann Dial, began hosting the celebration on their farm northwest of Lake City. In 2003, the event moved to the Dial’s son Dwight’s farm east of Lake City. The celebration has been going strong ever since, attracting up to 50 or 60 guests each 4th of July. Along with the fireworks at dusk, the big attraction is the food. Countertops spanning the width of Dial’s two-car garage, along with additional tables, are loaded with homemade fried chicken, roast pork, casseroles, cheese potatoes, baked beans, salads of all kinds, deviled eggs, cakes, pies, candies and more. 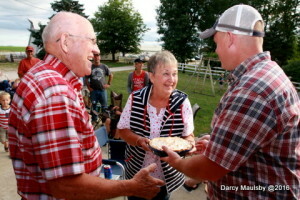 Andy Dial presents a lemon meringue pie to Jim and Joy Angove on their 50th wedding anniversary. ringue pie. 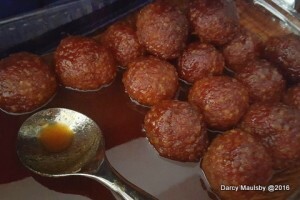 Schleisman also brought a number of classic dishes, including glazed ham balls. Oh yeah, that amazing Iowa classic that makes any picnic a little more memorable. I couldn’t have said it better. Let’s eat! Andy Dial used his Grandma Alice Ann Dial’s recipe and his Grandma Dottie Loeck’s cast-iron skillet to make this fried chicken, which is always a star of the 4th of July picnic. 4 dozen chicken hind quarters separated into legs and thighs. Combine breading ingredients until mixed thoroughly. Place breading mix into a 9.5-inch pie pan. Beat eggs and milk together until mixed thoroughly. Place egg wash in a separate 9.5-inch pie pan. Place chicken pieces first in the egg wash until liberally coated; then transfer to the breading mix and turn until coated fully. Once coated with breading, place chicken pieces into hot oil in frying pan. (Andy Dial prefers a cast-iron skillet.) Turn pieces ever 2 to 3 minutes until golden brown all over. Place into roaster pan at 350 degrees to finish cooking through and keep warm until serving time. Note: To keep chicken crispy, serve immediately after frying. Glazed Ham Balls are an Iowa classic! Jolene Schleisman of Lake City uses 4 pounds of a ham-ball mix from the locker in Lake City to make these tasty ham balls. Her recipe shows how to make your own ham-ball meat mix, however. These ham balls can be made ahead and frozen (unglazed) to be baked later. Combine ground ham, ground pork, oatmeal or cracker crumbs, eggs, milk and pepper. Shape mixture into balls. Freeze the ham balls to bake later, or place them in a greased, glass baking dish. To make the glaze, combine brown sugar, apple cider vinegar, dry mustard, BBQ sauce, water and honey in a saucepan. Cook over medium heat until sugar dissolves. Andy Dial used a recipe from his mother, Jane, to create this potluck favorite. Slice hard-boiled eggs in half lengthwise. Remove yolks, smash and mix with seasonings. Refill egg whites with seasoned yolk mixture. Calico Beans are healthy and always a hit at Iowa picnics. Jeanne Devine of Lake City brought along this potluck classic, which she created from a recipe on the Taste of Home website. This recipe can be easily doubled for a larger group. In a large skillet, cook bacon over medium heat until crisp. Remove to paper towels to drain. Discard drippings. In the same skillet, cook beef and onion over medium heat until the meat is no longer pink; drain. 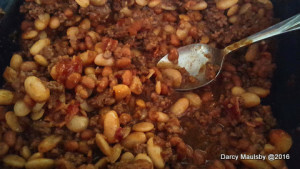 Combine the beef mixture, bacon, beans, brown sugar, ketchup, vinegar, mustard and salt. Spoon into a greased 2-quart baking dish. Bake, uncovered, at 325 degrees for 45 to 60 minutes or until the beans are as thick as desired. Yield: 8-10 servings. 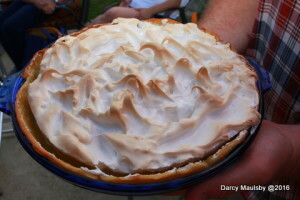 This homemade pie was inspired by Alice Ann Dial’s famous Lemon Meringue Pie. Alice Ann Dial’s signature pie is distinguished by its fresh lemon flavor. To mix the pie filling: Blend sugar, egg yolks, water, cornstarch and salt. Cook until the mixture thickens and bubbles up. Remove from heat and add lemon juice and butter. Pour the filling in a pre-baked pie shell made from Alice Ann’s all-purpose pastry mix (see recipe below) and cover immediately with meringue. To make the meringue, beat the eggs whites until foamy. Add sugar and cream of tartar. Beat slowly until peaks form. Spread on pie, and bake the pie for 20 to 25 minutes at 325 degrees Fahrenheit. Alice Ann Dial kept this all-purpose pastry mix on hand to save time when baking pie. Combine all ingredients together to create a crumbled consistency, but make sure the mix doesn’t clump together. Store mixture in a covered container in the refrigerator. Combine the all-purpose pastry mix and ice water until the mixture leaves the sides of the bowl. Then roll out the dough. If you’re making a pie shell for a lemon meringue pie, place the crust in a pie plate and prick the dough with a fork on the bottom and sides before baking the crust at 350 degrees Fahrenheit for 10 to 12 minutes.